PIZZA TEEN! : Shut Up, Little Man! 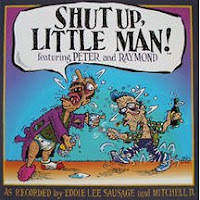 A woman named Sara Ksenia of Amarilo, Texas, has gone to the trouble of uploading a huge, stinking pile of the infamous "Shut Up, Little Man!" recordings to her VOX profile. From Wikipedia: "...Shut Up, Little Man! is the title of a number of audio-verité recordings of two violent alcoholics, Raymond Huffman and Peter Haskett. The recordings were made by "Eddie Lee Sausage" and "Mitchell D.", who lived in a bright pink apartment building—dubbed the "Pepto Bismol Palace"—in San Francisco's Lower Haight district. Eddie Lee and Mitchell moved into the apartment in 1987, and soon discovered their neighbors, Peter and Ray, who argued nearly constantly. There was also a third who is on tape, Peter's gay lover, ex army man, vagrant Tony...." I'm just going to post a link to her stash and be done with it since the idea of going to the trouble of showcasing the recordings here in some pretty way is a depressing prospect. I can't imagine that these will be available very long.